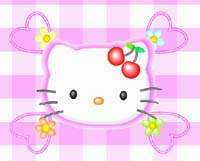 Description: A cute Hello Kitty screensaver for Microsoft Windows. You can make this cute screensave to display on your screen when your computer is on standby. How to install it: Download the file and open it. You will receive this dialog asking you if you wish to install it, answer yes. Once it has finished installing, open Control Panel, and choose Display, then choose Screen Saver from the tab on the top of the window. Go to the pull down menu to choose a new screen saver, and you should be able to see your new Hello Kitty screensaver there. 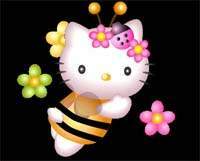 Description: See Hello Kitty in a really cute bee costume flying across your screen! How to install it: Download the file first, and then open the file using WinZip. Extract the file called bee.scr to your C:\windows\system directory. Once you have extracted the file, open Control Panel, and choose Display, then choose Screen Saver tab on the top of the window. Go to the pull down menu to choose a new screen saver, and you should be able to see your new Bee screensaver there. 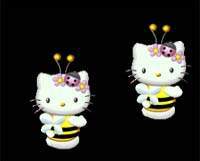 Description: See another version of Hello Kitty in a really cute bee costume flying across your screen! Except this one has flowers coming from the background. A very cute screen saver! How to install it: Download the file first, and then open the file using WinZip. Extract the file called bee2.scr to your C:\windows\system directory. Once you have extracted the file, open Control Panel, and choose Display, then choose Screen Saver tab on the top of the window. Go to the pull down menu to choose a new screen saver, and you should be able to see your new Bee2 screensaver there. 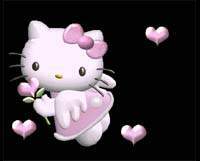 Description: A pink Hello Kitty with a pair of wings holding a heart-shaped flower flying! How to install it: Download the file first, and then open the file using WinZip. Extract the file called heart.scr to your C:\windows\system directory. Once you have extracted the file, open Control Panel, and choose Display, then choose Screen Saver tab on the top of the window. Go to the pull down menu to choose a new screen saver, and you should be able to see your new Heart screensaver there. 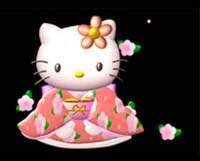 Description: A Hello Kitty dressed in traditional Japanese clothing with flowers floating down above her. A special new look for Hello Kitty! How to install it: Download the file first, and then open the file using WinZip. Extract the file called kitty.scr to your C:\windows\system directory. Once you have extracted the file, open Control Panel, and choose Display, then choose Screen Saver tab on the top of the window. Go to the pull down menu to choose a new screen saver, and you should be able to see your new Kitty screensaver there.